In early research on land grabbing, the initial focus was on foreign companies investing abroad, with a particular focus on those based in countries such as China, Gulf States, South Korea, and India. In recent years, it has become evident that the range of countries land investors originate in is far broader, and includes both North Atlantic – and EU-based actors. In this study, we offer both quantitative and qualitative data illustrating the involvement of EU-based corporate and financial entities in land deals occurring outside of the EU. This study also analyses the global land rush within a human rights framework, examining the implications of particular land deals involving EU-based investors and their impact on communities living in areas where the investments are taking place. 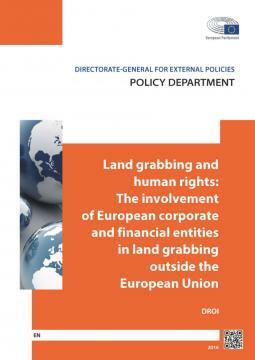 The research presented here builds partly on Cotula’s 2014 study on the drivers and human rights implications of land grabbing, but differs in that it focuses explicitly on particular cases of possible, actual or potential human rights abuses and violations, in the context of activities involving European corporate and financial entities. In our conclusions, we offer a series of recommendations on how the EU can more effectively address these issues.